Villa Mariette is on a small quiet award winning development in the pretty and very popular village of Peyia. This spacious three storey villa has been stylishly furnished for a very comfortable self catering holiday for up to six guests. The open plan lounge dining area has a contemporary L shaped sofa which converts into a comfortable double sofa bed, with coffee table, TV and DVD. The open plan dining area is adjacent to the fully equipped kitchen with cooker, hob, fridge, washing machine and microwave. The master bedroom on the second floor has patio doors with sea views and the second bedroom has twin beds. The family bathroom has bath, shower, sink and WC. Stairs lead up to the large private roof terrace with a convenient small kitchen, outside shower and stunning views. 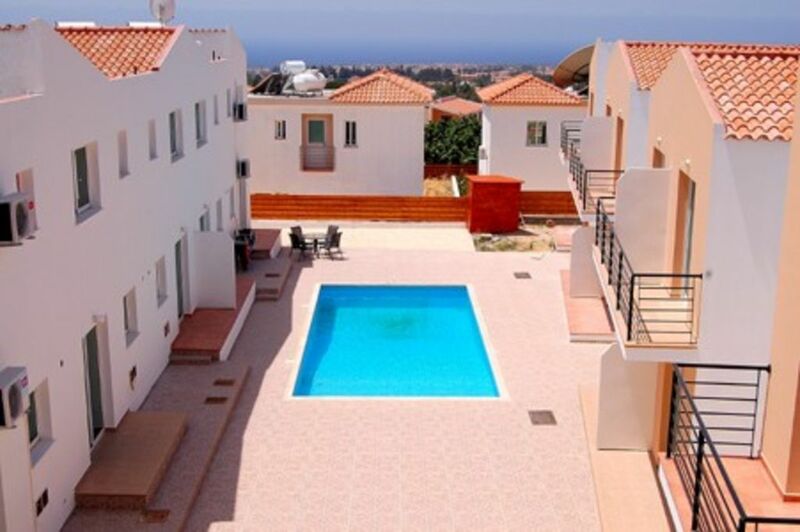 Guests can enjoy a dip in the large communal swimming pool to the front of the villa or visit Coral Bay just 3km away. Villa Mariette is in a great location close to village amenities and lots of things to see and do. Peyia area information : Peyia is a very popular and charming village situated on a gently sloping hillside overlooking Coral Bay. It is very traditional in look and feel with little winding streets and traditional stone houses with an old village church and shops at the centre. Peyia offers visitors a good selection of amenities including banks, doctors, two supermarkets, a fantastic bakery, butchers, fishmongers, DVD shop and launderette. It also offers a good selection of traditional tavernas where you can try the local fish or meat meze, or you can try Chloes that offers themed food evenings throughout the week. Coral Bay area information : The famous sandy beaches at Coral Bay are just a few minutes drive from Peyia and Coral Bay can be seen from Peyia. Coral Bay offers visitors an alternative selection of shops and restaurants with everything from Italian, Chinese, Cypriot and Indian cuisine. Several of the larger hotels in Coral Bay have very good health spas. Walking and Climbing in the Akamas Peninsular : Peyia edges the Akamas Peninsular a preserved area of natural beauty and habitat which is protected for the enjoyment of walkers and climbers. If you are a keen walker, climber or mountain biker you can enjoy guided tours and hire mountain bikes to venture into the Troodos mountain area. Whilst we try to describe the property as accurately as we can, we are limited by the website template. Our aim is to provide our guests with the best possible experience and so if there is anything that is particularly important to your stay or is unclear, please ask before booking. On the ground floor of the villa there is a convenient WC with wash basin. The modern family bathroom is on the second floor with the bedrooms and has a large bath with over shower, WC and sink with vanity unit. All towels including beach towels are provided for guests. Villa Mariette is an excellent choice for relaxing holiday in Cyprus. Property could be better signposted from the street however inside the facilities were excellent and in a very clean condition with excellent security. Roof terrace views very nice ample outside furniture available. Peyia is a nice village with lots of bars and restaurants, Coral bay is also local. A car is essential for this property however it is a good location for touring this part of the island. Villa was clean and well presented although the patio set on the roof terrace had obviously seen better days and reported this during our stay. It is in a very quiet neighbourhood which suited us down to the ground but would definitely recommend hiring transport as the nearest place to eat was a wee bit away and all uphill!! All in all though I would definitely recommend the villa and found Lisa to be a brilliant help. We are pleased to hear that you enjoyed your visit to Peyia and your stay in Villa Mariette. Thank you so much for your positive feedback and we are pleased to confirm that the patio furniture has been replaced and apologies that due to busy back to back bookings that it was not possible to replace before you arrived. It was a pleasure hosting you and we would love to welcome you to stay again. Myself and my partner had an amazing time in Peyia at this Villa. It has everything you need - it's a home away from home. The roof terrace is lovely too. The road and surrounding area is very quiet and it's lovely and relaxing in the day and at night too. Lisa the owner has been very helpful during our stay and replied to our questions instantly. We can't wait to stay again! Thanks so much! The property was exactly like the photos which were displayed. It was fully equipped with everything we needed during our stay. Very clean on arrival. Brilliant customer service. Would definitely recommend, not just this property but LifeStyle Assets. We are delighted to hear how much you enjoyed your stay in Villa Mariette and that it met all of your holiday needs and expectations. The views from the private roof terrace looking out at he coast are particularly wonderful at any time of the day. We do hope to welcome you back again for another holiday to Cyprus. House was fantastic. All the pictures are accurate. It was very clean and spacious. Swimming pool was terrific and a sun trap. Roof Top Terrace was really nice as there was a cool breeze and you could sit and watch the sun go down which was an absolute joy to watch. I would not hesitate in booking this villa again and hope to go back next year. We are delighted to hear how much you enjoyed your stay in Villa Mariette in Peyia and thank you for sharing your positive feedback and helpful feedback for other prospective guests to see. We look forward to welcoming you back to Cyprus next year! With an all year round Mediterranean climate, Paphos is very popular with visitors across Europe looking for a cosmopolitan holiday resort. Paphos is the most established holiday resort in Southern Cyprus and among its attractions are the ancient mosaic floors, historical sites, a beautiful old harbour, its modern hotels and restaurants, situated along the harbour front promenade. Paphos enjoys year round sunshine and an extended tourism season from March to December. Paphos offers a good selection of shopping ranging from well know high street stores such as Marks and Spencer to old markets and quaint winding streets lined with small shops. In addition to the wonderful choice of beaches and all year sunshine Paphos offers families a fantastic choice of modern or traditional restaurants, and many things to do and see, from water parks, to go carting, Golf to Luxury spas there is something for all ages to enjoy. Golf: Three golf courses are all within a 15 minute drive of the apartment the most famous of which is Aphrodite Hills and Secret Valley both are open to the general public. Ski: Cyprus offers both sun shine and snow. The Troodos Mountains offer good skiing in the winter and great climbing and mountain biking terrain in the summer.